Fitness is a personal journey. If you want to be your best, you have to train with the best. That doesn’t simply mean hiring a certified Personal Trainer; it also means finding someone who understands your personality and fitness goals. Inspired by this belief, we only hire experienced trainers with diverse backgrounds who are committed to our core values ­­ inspiration, community, and exceptional service. We have assembled an elite group of fitness professionals who will inspire, support and educate you to greatness. I pride myself on staying on top of the newest fitness trends and finding ways to provide my clients with unique, fresh, and creative workouts that will challenge and inspire them. I feel that with a positive attitude and the right motivation, anyone and everyone will love exercise & fitness. It’s a beautiful lifestyle, and you’re invited to join!! Jenny holds both an Associate's Degree from Heritage College and a Bachelor’s Degree from Kansas State University. She has been in the fitness industry for over four years, and if City Gym had a mascot, Jenny would be it! 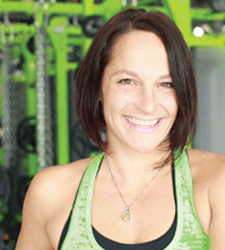 She is a Personal Trainer, Small Group Trainer, Group Exercise Instructor and professional generator of excitement. On the rare occasion when Jenny isn’t at the gym, you can find her at the dog park with her pups, hanging out with her husband, running a marathon, donating her time to the fitness community or rocking out as a lead singer in the cover band, Sellout.